Fort Meigs, built during the War of 1812, was a strategic fortification along the banks of the Maumee River in present day Perrysburg, Ohio. The fort withstood two British sieges in 1813 and became a turning point in the war for the American forces. The United States of America declared war on Great Britain on June 18, 1812, and the western theater of war played a significant role in early U.S. military plans. Unfortunately, the American military was woefully unprepared for war and suffered a series of defeats in the early fighting. In the first three months of war (from June to August of 1812), the U.S. lost Fort Mackinac in northern Michigan, Fort Detroit, and Fort Dearborn, which is now present day Chicago. Only Fort Wayne in the Indiana Territory remained in American control. This string of defeats continued into 1813 when the American forces were defeated at the Battle of the River Raisin in January 1813. The result of this battle was the loss for General William Henry Harrison of approximately one-third of his new Army of the Northwest. Fortunes began to turn for the Americans with the construction of Fort Meigs, a massive ten-acre installation that became the base to gather enough men and supplies to attempt a winter invasion into Canada in the winter of early 1813. When this plan failed to materialize, General Harrison used the fort as a defensive checkpoint to prevent any further British advances into American territory and to buy the American forces enough time to build a naval force to meet the British on Lake Erie and defeat them. Construction of Fort Meigs began in February 1813, and when completed in April of the same year, the installation contained seven blockhouses used for defense, five artillery batteries, two storehouses, and had approximately twenty artillery pieces to help defend the fort. Fort Meigs withstood two sieges by the British and their American Indian allies. Both sieges occurred in 1813 with the British objective to capture the fort or wipe it off the map. The Americans suffered many causalities but managed to maintain possession of the fort and thwart the British plans. It was these two victories at Fort Meigs that marked a turning point in the western theater of war in favor of the American forces. Shortly after the second siege of Fort Meigs, the British marched to Fort Stephenson in Fremont, Ohio, and were severely repulsed forcing them to retreat to their base at Fort Malden in Upper Canada. This was followed by the American naval victory on Lake Erie in September 1813. With the loss of Lake Erie, the British forces were compelled to retreat further east into Upper Canada. The American army pursued this retreating army and defeated them at the Battle of the Thames in October of 1813. The death in this fighting of the Shawnee war chief Tecumseh shattered the Indian Confederacy allied with the British. These victories reversed many of the American misfortunes early in the war and placed control of the western theater of war into American hands. 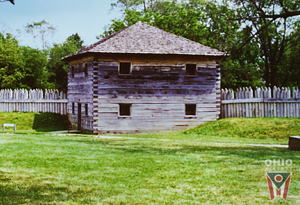 The Ohio History Connection reconstructed the fort in the 1970s, and most recently in 2003. Today, Fort Meigs is the largest reconstructed, wooden-walled fort in the United States and is a National Historic Landmark. The seven blockhouses, five artillery batteries and numerous earthworks appear much as they did during the summer of 1813. Exhibits in the fort’s blockhouses present the life of a soldier, the building of the fort and dramatic accounts of the two sieges against the fort in 1813. The Visitor Center houses classrooms, a museum store, and a museum. The exhibits focus on the themes of Era, Conflict, Understanding, and Remembrance. The exhibit also explores how historians and archaeologists learned what happened at the fort. Important artifact collections are featured in the museum exhibits, including War of 1812 weapons, accouterments, uniforms and personal items of soldiers. Historical interpreters dressed in 1812 clothing present demonstrations of camp life, weapons, and other activities throughout the summer. Reenactments and special events further highlight America’s rich military history.